TED Fellow 2017, Research Scientist at the Centro de Astrobiología, Madrid, Spain, PhD. Molecular Genetics and Microbiology, MSc. Biological Sciences, MSc. Biochemistry. What is life? If we hope to find life on other planets, what should we look for? Armando Azua-Bustos, a research scientist at the Centro de Astrobiología, Madrid, Spain, is researching life in one of the places you would least expect to find it – the Atacama Desert. He hopes to discover forms of life that are far different from those we know: a life that is not dependent on water. Armando’s findings may help us to develop new forms of agriculture, and hopefully, not only for here on Earth. 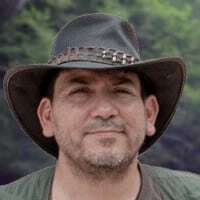 Armando: Hello, everyone, my name is Armando Azua Bustos; I am a Chilean scientist working in Spain. I consider myself to be an astrobiologist. Armando: Well, astrobiology is quite a recent field of research. It’s concerned with trying to understand the origin of life on Earth and the possibility of finding life elsewhere in the universe. And in my case, it seems we are looking for water as a proxy for finding life on Mars and in other places in the Solar System and beyond. And we’re trying to understand the close and intimate relationship between water and life in order to understand, not only life on Earth but, the possibility of finding life elsewhere by looking at water. Nerina: How do you conduct your research? Armando: Well, I try to understand the possibility of finding life on Mars. And since I don’t have $6.5 billion in order to send my own robot to Mars, what I do is I try to study the environments on Earth that most closely resemble the conditions on Mars. In my case, I’ve been studying the Atacama desert in Chile—since it’s the oldest and driest desert on Earth, and a world-recognised Mars model. Armando: Well, I have an interesting story behind that because when I got my first academic degree, I went into winemaking—I had a Bachelor of Science in winemaking. So I started working as a winemaker, but after working for a short time in that field, I realised that I liked science much better, so I came back to study and got a C in my academic degree. And I had a unique advantage that I was born and raised in the Atacama Desert. So when, in 2003, NASA proposed that the Atacama was a proper model of Mars, I detected that I had an advantage there because I knew the desert very well. I was now studying at all the same sites that, by my memory, I do remember seeing interesting facts, and interesting things that I am now going back to, in order to discover them again—but from the point of view of science. And actually, when I left the desert—since I was living in a small mining town, I had to leave that city in order to get to the college—I remember looking out the plane window and thinking, ‘Well, I will never come back here, because there’s nothing to do,’ and years later, I’m thinking exactly the opposite. Every time I can, I come back to the desert because there’s so much to do. Nerina: How was it growing up in a desert? Armando: That’s part of my story because there wasn’t much to do except explore the Atacama because in those times we only had two TV channels. So most weekends my parents would take us roaming in the desert, everything from following Inca trails, to finding fossils, and taking our telescope out at night. So from a young age, I developed this love of exploring. And then when I was able to drive myself, I would go with my friends and do the same thing. In some way, I turned that hobby into a profession. So for others, they call it work, but in my case, I have a lot of fun with it. Nerina: What is the most fascinating aspect of the Atacama Desert? Armando: The fact that life is able to endure even the most extreme conditions. You’ll see a picture of this place, and you’d say, ‘How is it possible that anything would be able to live here?’ But if you know what to look for, you will find one or two of these different life forms, and you’ll wonder how it’s possible. It’s the way that life is able to adapt to the most extreme conditions that is fascinating, in the case of the Atacama. Nerina: The Atacama Desert is also a very important place for research right? Armando: Well, it’s also fascinating that in the Atacama, you have the biggest telescope on Earth. And by 2030, 70% of the biggest telescopes on Earth will be located in the Atacama because of its clear skies. You have very little water in the atmosphere, so that’s a huge advantage; you have almost no clouds in those types of areas, so that’s a place you want to have your telescope—your very expensive telescope. So it’s incredible that from that same place that people are looking up in order to find the answer to ‘Are we alone?’ I’m doing exactly the same, but looking down to the soil trying to find the same answer. Armando: There have been entire conferences trying to define a common definition of what life is, and it has been not achieved. Amazingly, even a small child can recognise what is a living thing and what is not. But we have not been able to come up with a universally accepted definition of what life is. Nerina: What did you discover? Armando: What I have found is that life is able to adapt to the most extreme conditions of the Atacama, in terms of UV radiation and desiccation. So I have discovered a number of different, new, microbial species, and also a few plants that are able to live with very little amounts of water. In one of these very dry places, where it was reported that it was as dry as Mars, even in that place we have found a number of different microorganisms. This suggests that, from the point of view of water availability, you shouldn’t have any problems in detecting life on Mars. Nerina: Why is it this way? Armando: That we don’t know. We still don’t know how it’s possible that life is able to survive with such little water. Actually, I’m now writing an entire research proposal in order to understand what the molecular mechanisms are that explain why these microbial life forms are able to tolerate such low conditions of water availability, and how they are able to endure in that particular condition. Nerina: What is the most relevant question you have right now? Armando: The question that I have now is that since the Atacama is the driest and oldest desert on Earth, it seems interesting from the point of view of evolution life always has the same selective pressures in order to be very efficient in the capture, retention, and use of water in order to survive. So we now think that most life on Earth, when confronted with desiccation, will either die or enter into some mode of waiting, a mode of stasis, waiting for better conditions in order to reassume roles and metabolisms. But in the case of the Atacama—and this is the driest research I’m proposing and doing now—I’m saying, maybe in the Atacama, the life forms that are able to live there already adapted to that, and have adapted to live with very little, if no, water at all. And that would change the definition of life on Earth because all life on Earth depends on water and is related to water. And we have preliminary evidence of microorganisms in the Atacama that some of their biochemical functions are still able to go on without, or with almost no water at all. So the big question that I have now is, ‘Is life able to become, at some point, independent of the presence of water?’ That’s my main question now. Nerina: And what is the challenge here? Armando: The challenge here is both intellectual and from the method because of the common paradigm now. The actual paradigm that is from the scientific community is that life either dies or enters into some form of rest in order to wait for better conditions in terms of water availability. So you should not see any metabolic activity in the desiccated state. So first, you have to think really hard about what experiments you’ll have to undertake, in order to prove that you are really seeing some type of life form that is able to grow, and still has some metabolic activity in the desiccated state. To me, it’s like showing you have a dancing mummy! You know, mummies that are able to walk, and talk, and go around. It’s the same intellectual challenge trying to convince a community that’s saying, ‘You should not have any activity in the desiccated state.’ And I’m proposing exactly the opposite. It seems that here in the Atacama, for the given reasons, I do expect to have active metabolisms, where life is still going on, with almost no water at all. Nerina: What could this research mean for our future? Armando: Of course, there’s a basic idea on how to understand the close relationship between water and life, in using these kinds of microorganisms. You may also think about the potential applications of understanding that kind of tolerance. We do know, for example, that some of the genes we have already discovered, that some people have worked with similar genes of other desert species in much wetter deserts. In this case, they have to produce one gene, for example, to make a plant. And now, instead of irrigating that plant every day, you can irrigate it every week, and the plant will be just fine. So, it has a huge implication on developing new crop features that are highly tolerant to desiccation. So having that kind of species, that requires much less water to survive, would be a great advancement for science and for humanity. Nerina: So, your work could influence agriculture on Earth, but you’re also researching how to grow plants outside our planet, right? Armando: Well, remember the movie ‘The Martian’, where Matt Damon grows potatoes on Mars? Well, we actually don’t have any experience of that. So we’re trying to send along with NASA a small greenhouse, to Mars, in order to grow the first plant outside of Earth. The idea is to take seeds to Mars in a closed, small greenhouse, in order to see if those seeds will germinate on Mars by adding a little water to that closed container—to see if they will germinate as well as they would on Earth—considering that on Mars, they would have less gravity and much more radiation. So we’re doing those very preliminary experiments thinking about human colonisation on Mars and also on the Moon. Nerina: Would you like to go to Mars? Armando: No. Not yet. It’s quite dangerous. I mean, only one-third of whatever you send to Mars arrives there. So it’s quite dangerous. Maybe in 50 years, if you have at least a 50% chance of coming back alive, then I will be interested in going to Mars. But for now, it’s just too dangerous. Armando: I see myself as an expert in my field, and I see myself already having sent a few things outside Earth—to the International Space Station, maybe to Mars, maybe to the Moon. Nerina: Where do you see humanity in 100 years? Armando: I see humanity, hopefully, as a wiser species. We are just learning about all the damage that we have done to our planet—I hope that in 100 years that, again, is a lesson already learned. Nerina: What does it mean to you to be a scientist? Armando: It is an important role because we are producing new knowledge. Knowledge has no value if you don’t share it. So, from my point of view, scientists should be very humble and always be available to share what they have learned with others. Nerina: You wrote a children’s book called, ‘Are We Alone’, why did you write it? Armando: Because I detected that there was no book on Astrobiology for children. Amazingly, since this is a field that has many researchers, no one tried to close that bridge in order to get astrobiology to be a well-known term—as is Biology, Chemistry, and Physics. So that the next generation knows about Astrobiology being a proper field of science, that was my idea. Nerina: Why is it important to write for children? Armando: I was inspired by Jacques Cousteau, by Carl Sagan, and others, in the joy of discovery, in the joy of learning new things. So, what I’m trying to actively do is talk with children from very young ages to encourage the students in the joy of learning new things. Because that can only be positive for you—independent of whether you go into science, humanities, or art—that drive, in order to better yourself in order to do things that contribute to humanity, that’s very valuable. Armando: Well, you must consider that just in the close vicinity of the sun, like in your own neighbourhood, we have now detected almost 4000 different planets—and that’s just in the close vicinity of the sun. And it has been estimated that in our galaxy alone, there are more than 1 billion planets—and from that fraction, there should be at least 100 thousand inhabited planets. So if life has been able to adapt to so many different conditions on Earth, it wouldn’t surprise me that that would be the same case in other solar systems and beyond. So are we alone? I’m positively certain that we are not alone. Nerina: What more would you like the world to know about the Atacama? Armando: Well, what I’m trying to do now is change the view that the Atacama is a sterile place. It’s interesting because even the definition of ‘desert’ is that there’s nothing interesting to see. If you go to a party where there’s no one around, or things are very boring, you say, ‘Well, this party looks like a desert.’ Well, I’m trying to change the definition to mean that deserts are as interesting places as jungles—but you have to be more subtle in the way you look, in order to find the interesting things that are happening in deserts. Nerina: What does it mean to look at the sky in the darkness in the Atacama? Armando: Well, it’s amazing because in the Atacama the skies are so clear—and there aren’t many places where there’s no light pollution. I can remember walking in the Atacama on a moonless night and seeing my shadow produced by the light of the stars, a star shadow. That is amazing, and I don’t think there are many places in the world you can see that; a star shadow. Nerina: It sounds incredible. What do you miss when you’re not there? Armando: I miss the wind. I miss the amazing landscape that reminds you of your lone place in the universe. Nerina: Why do humans look for other places? Armando: Well, that is inherited in all of us. Humans explore. Even me, or you, if you see a small hill, you feel compelled to go up that little hill to look around. If you are around a corner, you feel compelled to see what’s on the other side. We are, by nature, explorers. So, now that we have explored almost all of the places we can explore on Earth, we are now looking abroad. It’s inbuilt in ourselves; we want to see what’s on the other side. Armando: A more kind society. Kind—we have to be kinder to each other. I am a scientist, but I’m also a Christian, so the principle that guides Christianity, and all the good religions, is to be better with the people around us. It is very simple. I always tell my students this, try to do something good for anyone at least once a day. If you do that, calculate how many good things you will have done by the end of the week, by the end of a month, by the end of a year, by the end of a decade, and by the end of your life. When you do that, and if you do that, you can go to the other side, whatever that other side is, with pride. Armando: You know, when you say what motivates you, you have to define that motivation in order for it to drive you forward. But I don’t need such motivation because I have so much fun with what I do—I enjoy what I do so much—that I have no need for motivation. Do you know what I mean? Armando: I do have a lot of fun with what I do, so I don’t need such motivation. Nerina: Is there something that you would like to change if you had the possibility? Armando: That’s a very interesting question, I will think about that until tomorrow! I would go back to the point where hominids were evolving, in order to remove the tendency of violence in Homo sapiens. That I would do; that would solve so many things. Armando: A dream? Just to be happier, simple. Nerina: Thank you, so much Armando.